I hoped, that last month’s post would knock something free in my brain and I would be able to get back to cooking adventurously and writing about it. It did actually knock something loose, because I managed to hit both my targets for the month within a week of writing the post. Hooray! I manage to combine both my challenges in one during May by baking something from my new cookbook. Technically this is a more substantial variation on a theme from a previous cookbook of hers. 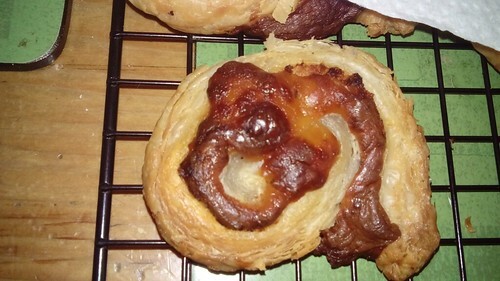 I’ve previously made pesto pastry puffs (and for that matter nutella puffs too) from instructions that were a side-not on another recipe – a way of using up left over pastry. This time they’re the main feature and you’re supposed to fill them with chorizo and lemongrass. I chose to make a vegetarian version picking and mixing from the alternate filling option that the recipe offered to some up with smoked cheese and sundried tomato paste puffs. With the chunkier filling these are somewhat more substantial than the previous versions I’ve made, but that’s no bad thing, turning them from canapés to a light lunch. They are absolutely amazing hot, but are a bit claggy cold and don’t re-heat well so I’d recommend only making them when you’ve a few people round for nibbles to help you eat them up while they’re still warm. Either that or just make a smaller batch, or maybe a half batch each of the savoury and the sweet? The second one is a bit of a cheat. I wasn’t originally going to count it, but its fun so I’m going to mention it anyway. The recipe book that I’m working through at the moment is front heavy on canapés and cocktails and the like. One of those funny little things, was making fruity icecubes for cocktails and summer drinks. As the weather was rather nice for a sizeable chunk of May – it seems a very long time ago, looking out at the June rain – I decided to try my own version with blueberries. Blueberry icecubes, I’m delighted to report, are rather tasty, though I think if I make them again, I might add a teeny amount of blue food colouring to the water to really make them pop visually. 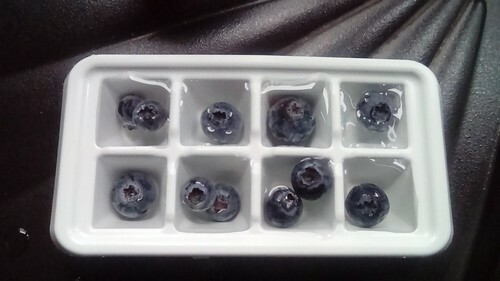 The downside of blueberry icecubes, is that if the blueberry is too close to the top of the cube and end up poking out of the water as they freeze, they sort of pop, and look like they’ve frozen mid explosion. 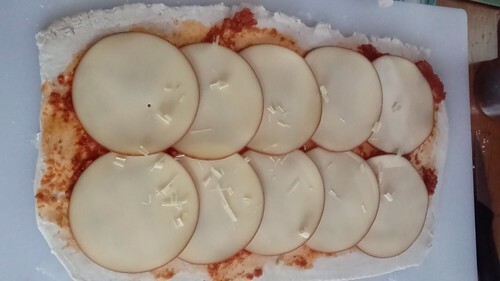 Which is kinda comical looking, but not very appetizing if you’re serving them to someone else. There’s probably a reason the recipe suggested raspberries or strawberries. In which I attempt to do more writing earlier in the month, so I don’t spend the last weekend of the month frantically cooking and frantically writing. One or the other please! 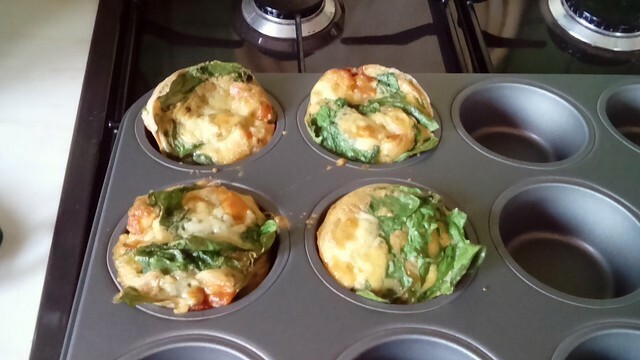 This month’s first experiment was Feta, Spinach and Basil Omelette Muffins. They’re really just mini baked omelettes but they are little bundles of delicious perfection. I’ve made them three times in the last month and I think I like them more each time. The first time I made them, they were mostly just egg and spinach with a little garlic and chive cheese I had left in the fridge and they were pretty good. But the second time I made them I had feta in the fridge and bought a small jar of sun-dried tomatoes specifically for the recipe – I’m not really a fan of them – and they were elevated to something amazing. In my original attempt the nutmeg was a bit much, but with the salty feta and the sundried tomatoes added to the mix, the flavours balanced perfectly. You’re supposed to mix the sun-dried tomato in with the eggs, herbs and spinach but I have enough trouble portioning the mix out correctly as it is, so I just put a piece in each muffin tin and then pour the mix over the top of it. Ensuring that I don’t have to fish bits of tomato out to ensure equal tomato distribution. The other advantage of putting the sundried tomato in first, is that a little of the oil it was stored in will seep out and stop the muffin sticking to the tin, removing the need to grease it. I had great plans for what I was going to make as my second April dish. I was debating between Beetroot risotto and pumpkin & sweet potato gnocchi. But then: disaster! The gas man came to fit a new meter, did his checks and…condemned our cooker. So my elaborate cooking plans for last weekend went out the window. We do now have a shiny new oven (that goes above 190ºC!) but I was forced to scale back my ambitions. I fell back on my old failsafe and made a smoothie. (Breakfast Green Super Smoothie, to be precise.) 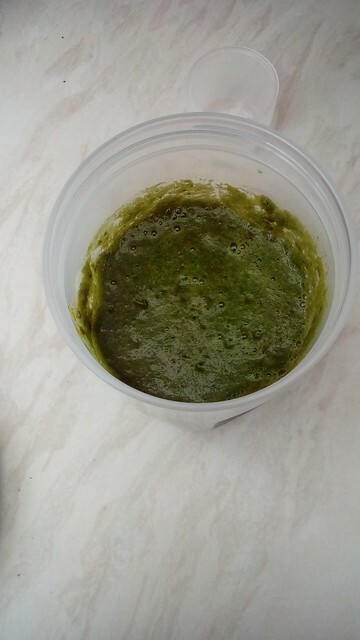 A proper green smoothie too, as its essentially pear and spinach. (It was supposed to be kale, but I’ll still not ready for that, and I had a bag of spinach in the fridge just sitting there.) And, well I can see why the turmeric is optional I think I’ll give that a miss next time, but otherwise pear and spinach is really nice – I couldn’t taste the ginger at all. I might add some kiwi next time go for epic greenery! 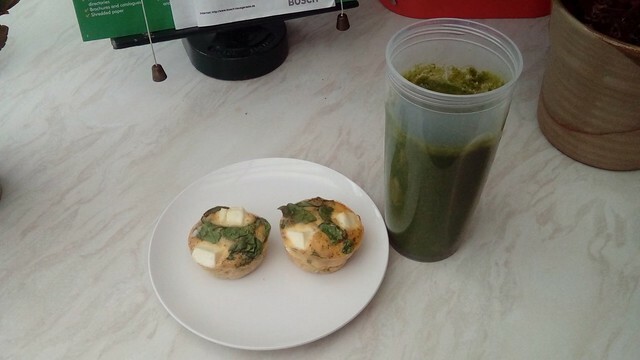 It also meant that I started May will a tall glass of overnight chilled smoothie and some cute little egg muffins – well, I had to check they still worked in the new oven didn’t I?